Neolithic architecture refers to structures encompassing housing and shelter from approximately 10,000 to 2,000 BC, the Neolithic period. In southwest Asia, Neolithic cultures appear soon after 10,000 BC, initially in the Levant (Pre-Pottery Neolithic A and Pre-Pottery Neolithic B) and from there into the east and west. Early Neolithic structures and buildings can be found in southeast Anatolia, Syria, and Iraq by 8,000 BC with agriculture societies first appearing in southeast Europe by 7,000 BC, and central Europe by ca. 5,500 BC (of which the earliest cultural complexes include the Starčevo-Koros (Cris), Linearbandkeramic, and Vinča. Kelheim (Lower Bavaria), Germany. Archaeological Museum: Reconstruction of a settlement of the Linear Pottery culture, 5th millennium BC. The Neolithic peoples in the Levant, Anatolia, Syria, northern Mesopotamia and central Asia were great builders, utilising mud-brick to construct houses and villages. At Çatalhöyük, houses were plastered and painted with elaborate scenes of humans and animals. 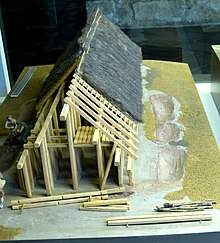 In Europe, the Neolithic long house with a timber frame, pitched roof, thatched roof, and walls finished in wattle and daub could be very large, presumably housing a whole extended family. Villages might comprise only a few such houses. Neolithic pile dwellings have been excavated in Sweden (Alvastra pile dwelling) and in the circum-Alpine area, with remains being found at the Mondsee and Attersee lakes in Upper Austria. Early archaeologists like Ferdinand Keller thought they formed artificial islands, much like the Scottish Crannogs, but today it is clear that the majority of settlements was located on the shores of lakes and were only inundated later on. Reconstructed pile dwellings are shown in open-air museums in Unteruhldingen and Zurich (Pfahlbauland). In Romania, Moldova, and Ukraine, Neolithic settlements included wattle-and-daub structures with thatched roofs and floors made of logs covered in clay. This is also when the burdei pit-house (below-ground) style of house construction was developed, which was still used by Romanians and Ukrainians until the 20th century. Elaborate tombs for the dead were also built. These tombs are particularly numerous in Ireland, where there are many thousand still in existence. Neolithic people in the British Isles built long barrows and chamber tombs for their dead and causewayed camps, henges and cursus monuments. Megaliths found in Europe and the Mediterranean were also erected in the Neolithic period. These monuments include both megalithic tombs, temples and several structures of unknown function. Tomb architecture is normally easily distinguished by the presence of human remains that had originally been buried, often with recognizable intent. Other structures may have had a mixed use, now often characterised as religious, ritual, astronomical or political. The modern distinction between various architectural functions with which we are familiar today, now makes it difficult for us to think of some megalithic structures as multi-purpose socio-cultural centre points. Such structures would have served a mixture of socio-economic, ideological, political functions and indeed aesthetic ideals. The megalithic structures of Ġgantija, Tarxien, Ħaġar Qim, Mnajdra, Ta' Ħaġrat, Skorba and smaller satellite buildings on Malta and Gozo, first appearing in their current form around 3600 BC, represent one of the earliest examples of a fully developed architectural statement in which aesthetics, location, design and engineering fused into free-standing monuments. Stonehenge, the other well-known building from the Neolithic would later, 2600 and 2400 BC for the sarsen stones, and perhaps 3000 BC for the blue stones, be transformed into the form that we know so well. At its height Neolithic architecture marked geographic space; their durable monumentality embodied a past, perhaps made up of memories and remembrance. In the Central Mediterranean, Malta also became home of a subterranean skeuomorphised form of architecture around 3600 BC. At the Ħal-Saflieni Hypogeum, the inhabitants of Malta carved out an underground burial complex in which surface architectural elements were used to embellish a series of chambers and entrances. It is at the Neolithic Ħal-Saflieni Hypogeum that the earliest known skeuomorphism first occurred in the world. This architectural device served to define the aesthetics of the underworld in terms that well known in the larger megaliths. On Malta and Gozo, surface and subterranean architecture defined two worlds, which later, in the Greek world, would manifest themselves in the myth of Hades and the world of the living. In Malta, therefore, we encounter Neolithic architecture which is demonstrably not purely functional, but which was conceptual in design and purpose. Early Neolithic water wells from the Linear Pottery culture have been found in central Germany near Leipzig. These structures are built in timber with complicated woodworking joints at the edges and have been dated between 5,200 and 5,100 BCE. The world's oldest known engineered roadway, the Sweet Track in England, also dates from this time. ^ Gheorghiu, D. (2010). The technology of building in Chalcolithic southeastern Europe, pp. 95-100. In Gheorghiu, D. (ed. 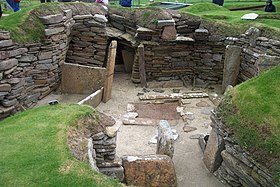 ), Neolithic and Chalcolithic Architecture in Eurasia: Building Techniques and Spatial Organisation. Proceedings of the XV UISPP World Congress (Lisbon, 4–9 September 2006) / Actes du XV Congrès Mondial (Lisbonne, 4-9 Septembre 2006), Vol 48, Session C35, BAR International Series 2097, Archaeopress, Oxford. ^ "The Sweet Track". Ancient History Encyclopedia. Retrieved 2019-02-24. 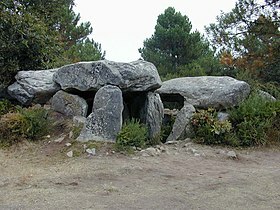 Wikimedia Commons has media related to Dolmen.